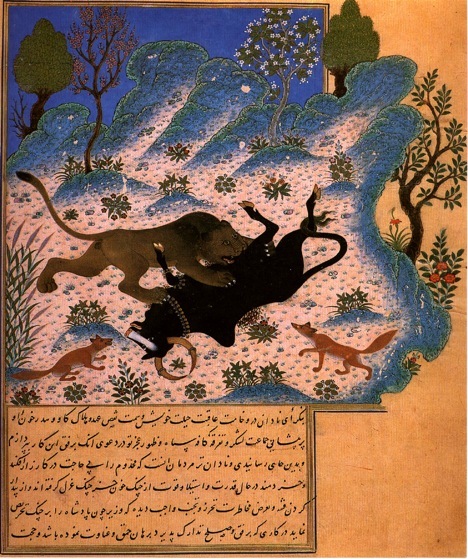 Kalila and Dimna was originally written in Sanskrit, probably in Kashmir, some time in the fourth century CE. 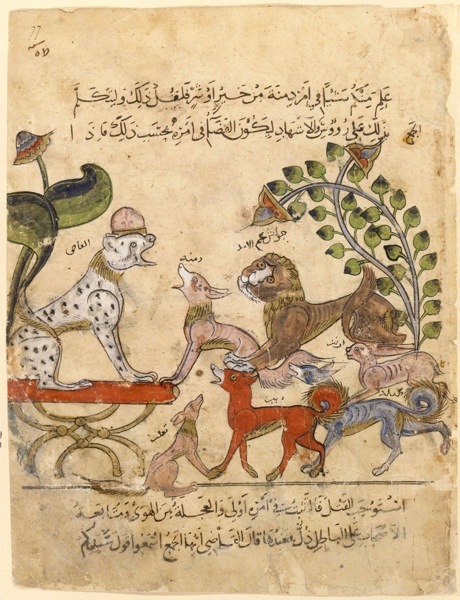 In Sanskrit it was called the Panchatantra, or "Five Discourses." It was written for three young princes who had driven their tutors to despair and their father to distraction. Afraid to entrust his kingdom to sons unable to master the most elementary lessons, the king turned over the problem to his wise wazir, and the wazir wrote the Panchatantra, which concealed great practical wisdom in the easily digestible form of animal fables. Six months later the princes were on the road to wisdom and later ruled judiciously. Two hundred years after that, a Persian shah sent his personal physician, Burzoe, to India to find a certain herb rumored to bestow eternal life upon him who partook of it. 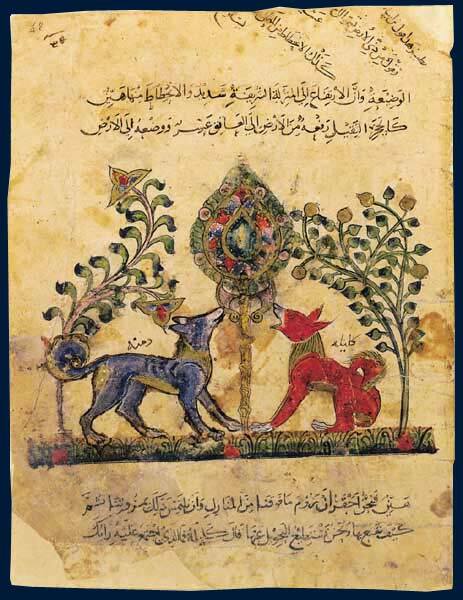 Burzoe returned with a copy of the Panchatantra instead, which he claimed was just as good as the miraculous herb, for it would bestow great wisdom on the reader. The shah had Burzoe translate it into Pehlavi, a form of Old Persian, and liked it so much that he enshrined the translation in a special room of his palace. 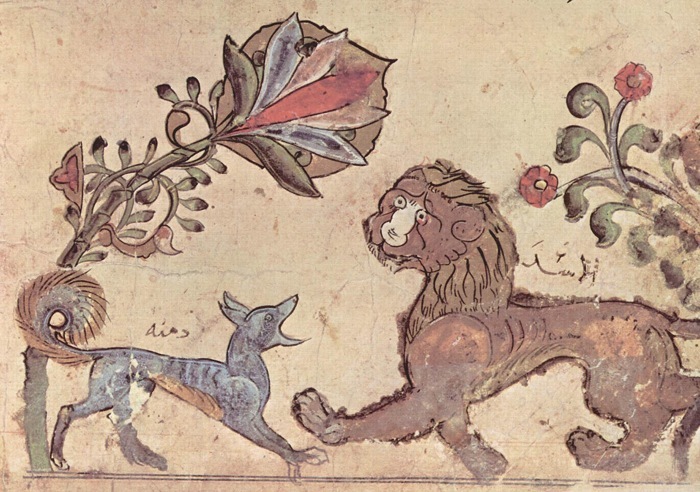 Images of the animals in varieties of paints and colours [are intended] to delight the hearts of princes, increase their pleasure, and also the degree of care which they bestow on the work." 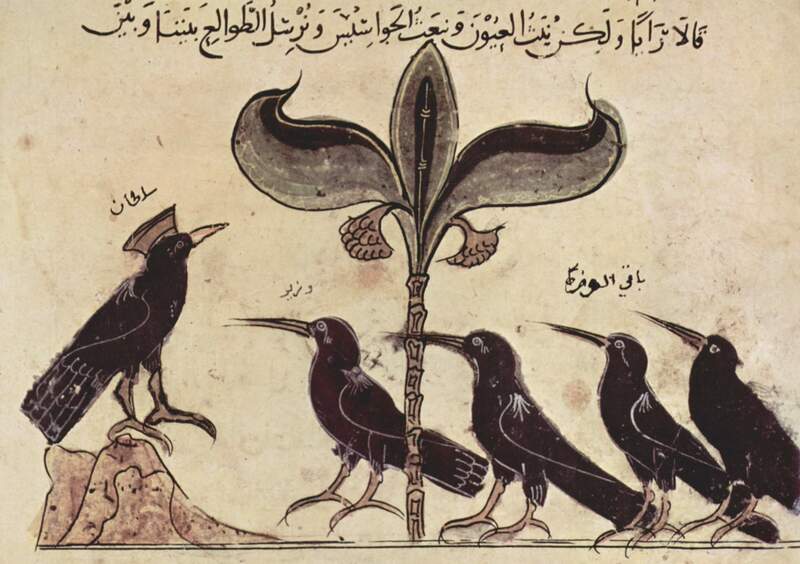 Ibn al-Muqaffa, 8th Cent. 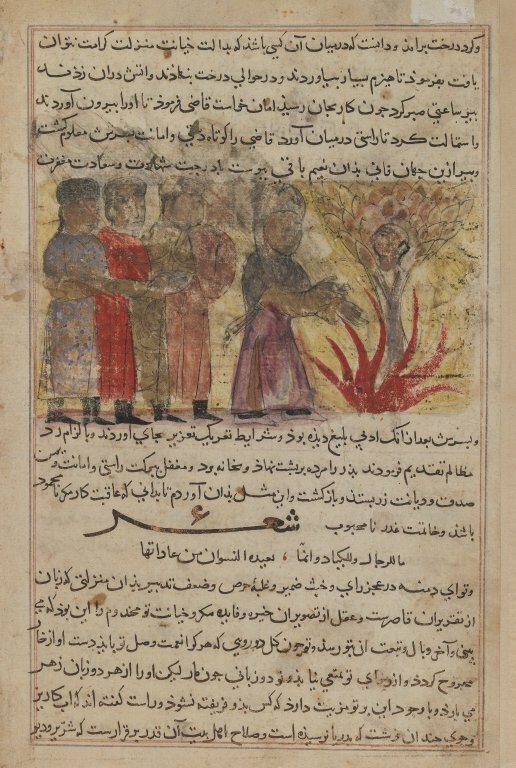 Three hundred years later, after the Muslim conquest of Persia and the Near East, a Persian convert to Islam named Ibn al-Muqaffa' chanced upon Burzoe's Pehlavi version and translated it into Arabic in a style so lucid it is still considered a model of Arabic prose. 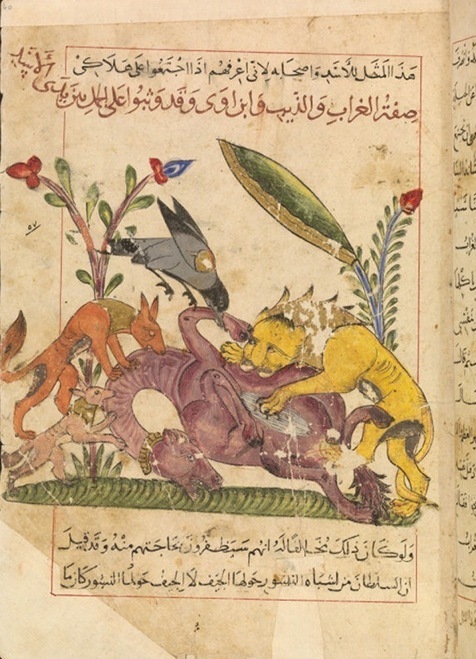 Called Kalila and Dimna, after the two jackals who are the main characters, the book was written mainly for the instruction of civil servants. It was so entertaining, however, that it proved popular with all classes, entered the folklore of the Muslim world, and was carried by the Arabs to Spain. There it was translated into Old Spanish in the 13th century. 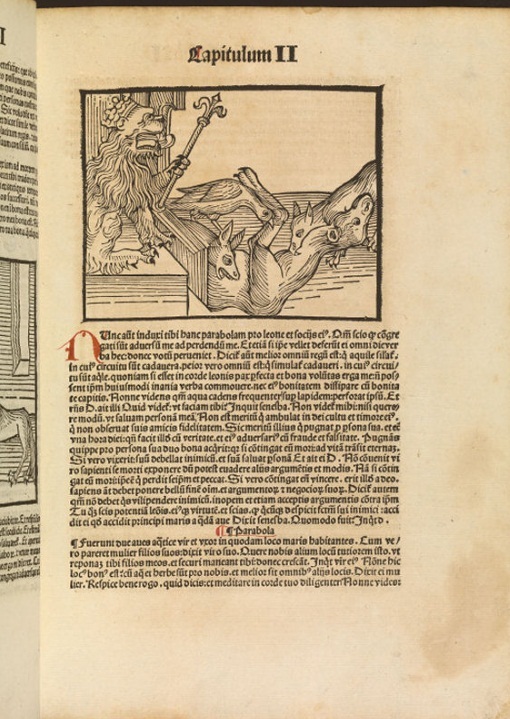 In Italy it was one of the first books to appear after the invention of printing. 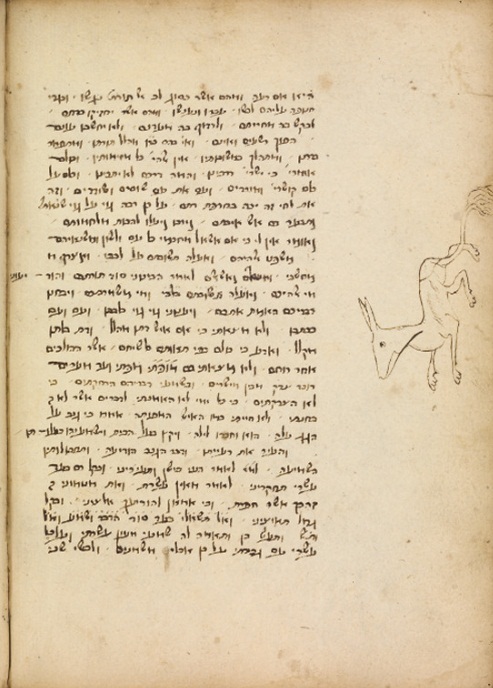 Jewish Encyclopedia: "Kalilah Wa-Dimnah (known also as Fables of Bidpai)"